Learn Surfing in an easy and fun way. Our 2 hour classes have the goal of teaching the basic notions understand this fantastic sport. During the first 15 min there will be a theoretical initiation with the notions to follow in the water and safety rules. The rest of the class will be practical (in the Water). From the first day you will have the possibility to surf your first wave. 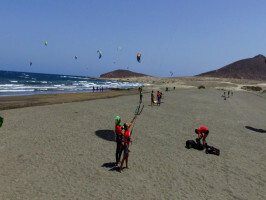 El Médano is a world-renowned destination for Windsurfing. During the 2 hours of class you will receive a theoretical part of a length of 20-25 min where you will be taught the basic concepts and the first maneuvers, you will also learn basic rules of navigation and safety regulations. The experience of our instructors, accompanied by the quality of our materials will make the approach to this sport very simple. 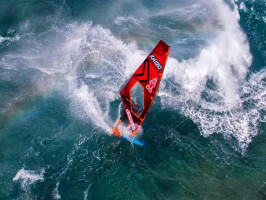 Kitesurfing is surely the most spectacular sport. In the course of 2 hours you will be taught to maneuver the kite on the beach with safety. The basic rules of navigation and safety rules will be taught. 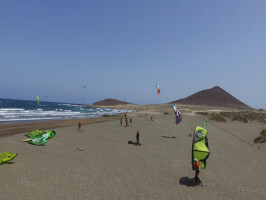 To be able to sail freely with Kitesurf, 3-4 courses will be needed. Teaching is divided into 3 parts: 1- Practice with the kite on the beach. 2- Practice with only the kite in the water "body drag" 3- Final practice with kite and board. You need to be able to swim to take part in this activity. - Duration: 2 hours approx. Remarks : Swimsuit , towels and sun cream.